Corner kitchen with worktop in stainless steel. The worktop has not right angle (98°) and consists of one single piece, round sink and round 3 gas burners hob are both integrated. The base cabs include a dishwasher width 45 cm and a fridge with freezer compartment. The backsplash is in thoughened acid-etched glass.On the right high cab width 90 cm made in opaque lilac lacquer. 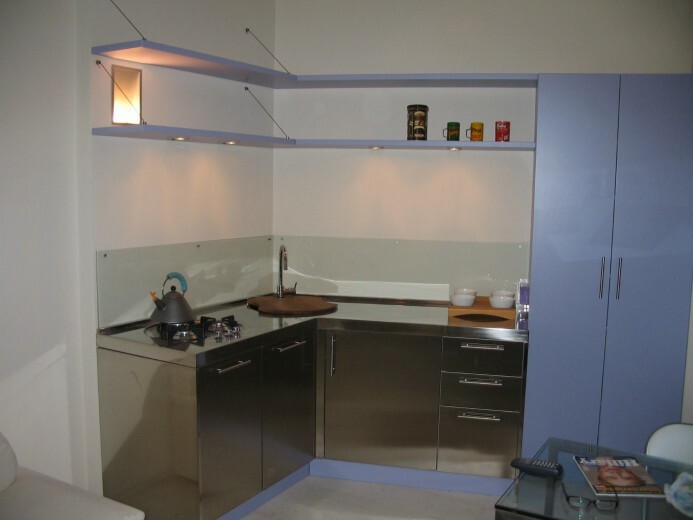 Richiedo informazioni per la scheda: "C027 Stainless steel corner kitchen"